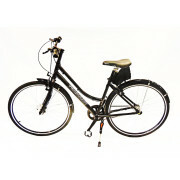 The Pedal Easy standard battery has an energy capacity of 320 Watt-hours. When battery power is used only to supplement pedaling and help on steep up hills, this typically translates to about 50 km of cycling over varied terrain (many users report a range more like 80 km). 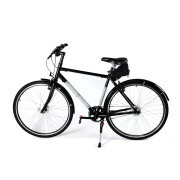 If the bike is not pedaled at all, the battery can power it for about 30 km at 15 kph. Of course, if more range is wanted, a spare battery can be carried, but the vast majority of cyclists never need it. The higher the energy capacity, the bigger the battery, and the heavier the e-bike becomes. For our ultra-light-weight model we have a lighter battery of less energy capacity (150 Watt-hours). At all times you are directly in control of the amount of boost and additional speed you will receive from the motor. Our motor weighs 1.6 kg and delivers an output power of 350 Watts to the wheel. The power of a typical cyclist during continuous riding is about 150 W (1/5th of a horsepower). A very fit cyclist can maintain 350 W for about 10 minutes and up to 600 W for a few seconds. Our motor is like having a strong cyclist of negligible weight with you on your bike. Does the bike self-regenerate power? Regeneration (recharging from pedaling or when going downhill) is not of much benefit to e-bikes, as it is with, say, hybrid cars. 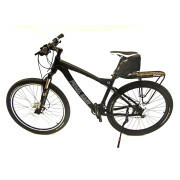 In general, with an e-bike you draw a net amount of energy from the battery pack to assist you riding. You then replenish this energy from the wall socket, rather than by working extra hard later on in the trip (regeneration on the flat has been likened to hauling a heavy trailer with two flat tires!) The cost of the electricity to charge an e-bike battery is trivial, and the price per kilometre is next to negligible. Major drawbacks of regenerative (direct-drive) motors are reduced efficiency during normal operation and drag during coasting due to electromagnetic “cogging” losses (even when not regenerating). For our design criteria (light-weight high-performance bicycles) geared-drive motors (as opposed to direct-drive) are the clear motor of choice. Since an inherent part of geared motors is a freewheel mechanism that completely disengages the motor from the hub when power is not required, they can not be made to regenerate. Some e-bikes, those with direct-drive motors, can regenerate and recover energy that would normally be lost during braking, particularly on long downhill runs. There are considerable losses of energy in this process though, so the net amount of energy recovered is not great….it is, of course, nowhere near being a perpetual motion machine!! In practice, regeneration extends the range by less than 10 percent. Our e-bikes use lithium-ion batteries. But there are many available types of lithium-ion battery, so we need to be specific. Performance, cost, and safety characteristics differ depending on lithium-ion type. There is a lot of mis-information and hype, so we have relied heavily on in-house resistance-load and dynamometer tests to evaluate & compare candidates under the particular conditions of service they face in our e-bikes. This has been a time consuming (and costly!) process, but it has also been very rewarding, as verified by the performance of our bikes. The battery we now use exclusively, which Panasonic calls type NCR (lithium nickel cobalt aluminum), has high energy density, good inherent stability and high amperage output. Prior to 2013 we offered two types of lithium ion battery, NMC (nickel-manganese-cobalt), and LFP (lithium iron phosphate). In 2013, after half a year of evaluative testing we were so impressed with the performance of this new NCR cell chemistry that we switched completely to this technology for all our bikes…about the same time Tesla, a leading developer of electric cars, also chose this chemistry for their high performance roadster! Note: The type of lithium ion battery that became infamous a few years ago in the news (laptops, Dreamliner aircraft) is lithium cobalt oxide (LCO). This chemistry is still used in many consumer electronics. We do not use this type of battery. Clearly e-bikes (electric bikes) are much more environmentally friendly than cars, but how do they stack up when compared to conventional pedal-only bicycles? It is surprising to most people that in a life-cycle analysis (total energy audit calculation) it has been determined that e-bikes consume 2 to 4 times less primary energy than pedal-only bicycles! Why? Because unless the human power is supplied by locally-grown food farmed by non energy-intensive means, the energy it takes to grow & get our food on the table far surpasses the life-cycle cost of the energy to charge the battery. An entertaining fact, and perhaps arguable, but the real environmental impact of e-bikes is that they open up cycling to people who might otherwise be driving a car. Many people would like to cycle, but shy away because of hills, distance, health reasons, knee problems, or having to shower and change at work. E-bikes make cycling a lot more accessible. The move to e-bikes is a world phenomenon. E-bike sales in Holland, long the foremost cycling country of the world, have continuously outstripped sales of conventional bikes for many years now. Major cities in China are alive with electric bikes, transporting goods and people everywhere. There are an estimated 200 million e-bikes in China alone. Annual sales of 740,000 e-bikes were reported in Europe and 350,000 in Japan in 2013.